Dubai is synonymous with innovation and luxury. This ultramodern emirate is considered as a destination of extravagance and a place where anything is possible. But the opulent flair also intimidates visitors with the notion that they might have to spend a lot to explore Dubai on a vacation. If you are looking for a luxury experience in Dubai, then the destination offers unparalleled ways to indulge in splurging at lavish shopping precincts and revel in exquisite resorts and luxury hotels. However, Dubai is also quite renowned as a family destination and offers loads of places where you can spend quality time with your dear ones without worrying about stressing out your travel budget. Here is a list of sights and experiences in Dubai which you can check out on your budget family holiday in Dubai. ​ Dubai's towering structures and iconic architectural landmarks are beyond comparison. They are one of the reasons why Dubai has become popular among globetrotters. One of the best ways to view its extraordinary city vistas is by taking a cruise on the Dubai Creek. Another main feature of taking a Dubai Creek cruise is that it offers you a spectacular panorama of Dubai's breathtaking city skyline blending in with the contrasting sights of Old Dubai. Take an abra - a traditional Arabic wooden boat for an authentic cruise experience which costs just AED 1 per person per trip for a crossing from Bur Dubai to Deira. For an upgraded leisure experience, you can embark on a Dhow Cruise which gives you a pleasant voyage along with the option of having dinner and entertainment onboard. The Dhow Cruise Dubai Creek rates starts from AED 20 onwards per person. The evening experience is particularly mesmerizing to watch with Dubai city glimmer in illuminating city lights as dusk ebbs into silent, starry night. Enjoy Delicious Dhow Cruise Dinner with Taruna Show and Entertainment show in the tranquil water of Dubai Creek and Marina Dubai. ​ Dubai being the mecca for shopaholics, there is no doubt that you would be tempted to splurge on a Dubai vacation. However, if you aren't in the mood to shop, still Dubai's amazing collection of malls offer you plenty of ways to take a respite from the desert heat and enjoy a good time with your family. One place that you shouldn't miss in Dubai is the Dubai Mall where you can enjoy myriads of activities without splurging on shopping. Spend an afternoon in the Dubai Mall marveling at the amazing art installations inside the mall such as the Human waterfalls, a giant Dinosaur fossil display or see the sights of awesome creatures of the underwater realm at Dubai Aquarium and Underwater Zoo. Step into the world of virtual reality at VR park which has a free entry to the public but if you wish to experience a ride, you will have to pay for a pass. 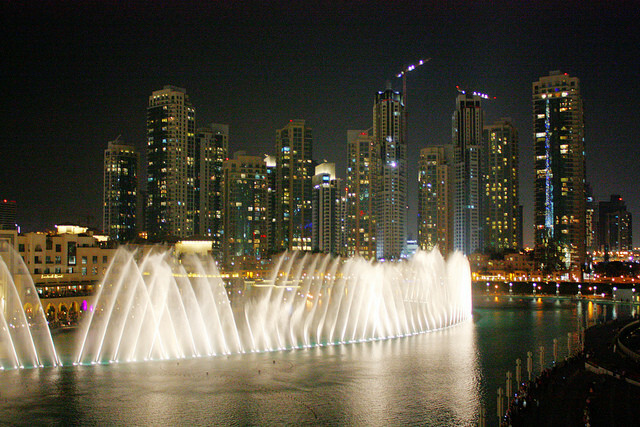 After a fun day indoors, step outside to the precinct as evening dawns to watch a spectacular show of dancing waters, music, and illuminations at the Dubai Fountain. This is also the perfect moment to capture some amazing moments near Burj Khalifa for your Instagram account. ​ Ever wondered how Dubai used to be long before its surge as a futuristic city? Head to the Old Dubai section of Dubai where you can get a glimpse of how Dubai functioned before it got ambitious and revolutionary. Visit the Old Souks of Dubai where traders and merchants still practice traditional methods of sale and offer a variety of Arabic products right from textiles, perfumes, and spices to gold and precious gems. For an in-depth Bedouin era experience, visit the Bastakiya Quarters at the Al Fahidi Historical Neighbourhood. This section of Dubai transports you back to the days when simple elements with brilliant techniques were used to modify buildings to have a natural and effective ventilation system. The wind tower houses at the Bastakiya Quarters are an example of this clever engineering. The timeworn structures are meticulously restored and preserved to give visitors a historic and cultural experience to cherish the charms of Old Arabia. On your tour, visit the art galleries and step into the courtyard cafes for a light brunch and a sip of Arabian coffee to complete your trip. One of the most popular things to do in Dubai on a Dubai holiday is the Dubai desert safari experience. The Arabian deserts are always considered as a must-do attraction on every Dubai visitor's travel list. And rightly so, as the experience is one of kind which takes you to a tranquil ambiance away from the urban glitz and provides an amazing experience with a touch of adventure. From AED 80 onwards, you can explore the expansive sand dunes on an exhilarating 4x4 vehicle ride, enjoy an exciting camel trip or get your heart racing at quad biking, skiing on the sand dunes and other sand adventure sports. You can either wind up your day with a serene sunset or extend your experience to an overnight Arabian adventure by shelling out a little bit extra to enjoy an enchanting night amid Arabian ambiance, traditional folklore, and lip-smacking barbeque dinner. The recent addition to Dubai's manmade spectacle is an artificial luxurious water shore arcade known as the Dubai Marina. This boulevard is teeming with contemporary skylines and luxury conveniences, but a stroll around this precinct wouldn't cost a dime. A trip to Dubai Marina lets you catch a glimpse of Dubai's ever-evolving concepts for a futuristic city. Rent a bike and explore this neighbourhood or head to Jumeira Beach Residence Walk - a 1.7 kilometer stretch along the Persian Gulf. Here, you can enjoy the beach front, splash around in the Persian Gulf and have photo opportunities against the backdrop of some of Dubai's astounding cityscapes..
​ If Dubai has been on your travel bucket list, but you have been hesitating to go forth with the vacation idea due to budget issues, we recommend you to go ahead, get a visa for dubai and plan a holiday with these places in mind. You would be quite surprised at the delightful experiences you managed to accumulate on your budget-friendly Dubai holiday.